Disclosure: I was given a $500 gift card from Izea on behalf of their client, Sears, to participate in their campaign and “grant a wish” for someone, then to share the experiences shopping at the retail store. There is also a contest you can enter with details below for me to grant perhaps one or more of your wishes. From my perspective, I see this as getting paid to provide my feedback more then getting paid to write a blog post, but as we have seen over the last few days with regards to Chris Brogan and his involvement in the K-Mart campaign, everyone has their own perspective. The program ‘rules’ are simple, Sears provides a $500 gift card to me, I go to one of their stores, then, after the shopping trip, I post about our experiences (which wasn’t all that good as you will soon read). Now here is the part that makes it cool for you. I hopefully am granting one of your wishes. Izea, who is running the promotion for Sears, is also going to be picking a winner of another $500 grant a wish package (instructions for entering below, but first a bit about our shopping trip and our experience with Sears). For starters, I should point out that Sears is not one of the stores I would shop for Christmas. For me, Sears is top of mind when thinking power tools, appliances and car repairs even – but not clothes, electronics or even furniture. In fact, most of our furniture in our house we have purchased off of Craigslist or a second-hand store, but it wasn’t my wish, it was Kristie’s, so I thought I would just ask her instead of worrying about it and really felt grateful to Ted for inviting me. Of course, Kristie’s first response was that she wanted a trip to Paris (where I just came from). Then she said, well we aren’t doing Christmas gifts this year so it doesn’t really matter. After a bit of haggling over what I meant by the word ‘wish’ (fix the world, solve for hunger, get a big sponsor for Social Media Club so we could hire an executive director etc..) I finally conveyed it had to be physically something I could buy – in other words a gift. After a few minutes she finally said what I knew she wanted, a Karaoke machine so she could let out her inner chartreuse. Of course, if she was going to get a Karaoke machine, I needed noise canceling headphones to be part of her wish 🙂 The other big thing she has been trying to get for the past year was a Wii. So we had our shopping list set up and after Social Media Club hosted a Social Media Breakfast, we set out to Sears at Aventura mall in North Miami. I grew up here in Miami (where we are visiting for Social Media Club events and also to spend some holiday time with my 92 year old grandfather) so I knew generally where it was, but I wanted to be sure. So we searched Sears on the Google Maps app on our iPhone. There were actually too many listings for Sears in North Miami to easily find it so we went to the sears.com Web site, which was actually optimized for mobile. The only complaint with the mobile site is that they need to have the store’s addresses linked to a mapping service, because we had to manually transfer the address into the map app which made it a bit harder. The one unfortunate thing about the timing of this campaign is that we are only two weeks away from Christmas and ended up heading to one of the busiest malls in the United States on a Saturday afternoon at 1pm. Needless to say – the mall was packed. In fact, parking was so tough we had to use the valet service after searching for nearly 30 minutes, but once that was all sorted out, we headed to Sears with the gift card in hand and our simple shopping list at the ready (though I still have no idea which Wii games we really want other than Rockband – see the musical theme of this wish?). Walking into the store, we noticed the new signage highlighting the campaign “Don’t just give a gift, grant a wish” – but the rest of the store felt the same as it did when I used to shop here with my grandparents. 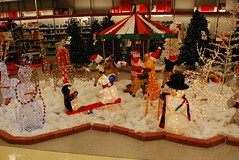 Even the Christmas yard decorations setup felt a bit less then modern. I guess the best word to describe it is that it felt ‘dated’. 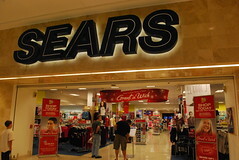 In fact, when talking to my aunt about it later, she said “Sears has always been the same, they never change”. For some people this is good, for me, this is not so good. Reminds me of the many ad campaigns such as “this isn’t your parent’s XYZ any more” except in this case, it still is. Anyway, we headed straight for the electronics department and found the karaoke machines. We found the one Kristie wanted on sale at a great price, only $90 down from $150. Though we couldn’t find the extra microphones or music, but that’s another story. We didn’t find any Wii’s… so we found another sales associate who told us they were sold out and didn’t know when they were getting it in. Bummer, but this has often been the case with Nintendo for the past year plus, so that is not entirely Sears’ fault. In fact, when we got back I ran across this article about November being the biggest month of video game console sales ever. At this point, we said, ok, lets go check out the noise canceling headphones – unfortunately the choices were limited and I didn’t see the headphones I wanted. We did find something suitable though, but then I couldn’t get it off the rack (it was locked in somehow). With these frustrations mounting, we realized we should just wait to get the Wii from sears.com and since we had to fly home anyway, should get the karaoke machine online too. After all, why spend $25 to check an extra bag? or waste the time going back when you can just order online and get free shipping. While walking out of the electronics department to check out the rest of the store to see if we would be inspired, we did see a great deal on a Panasonic cordless phone for the house, to replace the broken ones we have been using. The electronics department was situated next to the appliances and our eyes moved to a beautiful stove that reminded us of that really cool and expensive French one we saw elsewhere, but this was made by Kenmore and was about half the price of the one we saw previously. If we owned our house and had a few thousand extra dollars, we might have been tempted to purchase it as our current stove is relatively small. Since we rent our flat and are paying down our debt instead of making major purchases, we set aside the big wish. After a quick lunch break, Kristie decided she wanted to use some of her wish to buy some gifts for my nephews, so we went back to the store for round two. After searching both floors of the entire store, we finally found the toy department, by the power tools and the weight lifting equipment. Unfortunately there really was not much of a selection, just an aisle or so with a good percentage of that being toy Craftsmen power tools. They also had a small display of Hasbro board games, many of which were priced at $29.99, essentially $5-15 more than the same games cost at other stores. While it was ‘free’ money to us, there is still a sense of wanting to find value so we passed. Kristie also needed a pair of socks (because she forgot them at home) so we picked those up while there. So all in all, the Sears shopping experience hasn’t changed much since I was a kid – in the case of the floors, shelves and overall feeling of being in the store, it doesn’t seem like it changed at all. If I am looking for appliances, I still trust Kenmore. If I am looking for power tools, I still trust Craftsmen. Now, the one thing that did seemingly change is the clothing department, they actually have some cool stuff there, including some great styles from LL Cool J, who has also put together this good video as part of the grant a wish campaign. In short, we had some really tough challenges which shows why programs such as this one being run by Izea are risky for companies to pursue, but also invaluable if handled well. I still haven’t seen them engaged in the kerfuffle with Chris Brogan this weekend though… Further, campaigns such as this expose the real shortcomings of the end to end branding experience and how important it is for all different groups within a company to work together. Finally, it proves once again that marketing alone cant solve a company’s problems with its’ market relationships. Hopefully though, this is a learning opportunity and not a censorship opportunity. Went in to buy a karaoke machine, noise canceling headphones and a Wii, came out with a pair of socks and a new phone system for the house. We are going to order the karaoke machine online, and it seems we have to wait to try to get the Wii at a later date as we realized Sears currently only sells the Wii bundle ($500+) which is not what we want – we just want the Wii console ($200+) and the chance to select our own game and accessories. Shame on Nintendo, shame on retailers for going along with this exploitative bundling that forces people to buy games they don’t want or need. Tried to also get toys for my nephews, but the selection was not very good – specialty stores and other Sears competitors clearly perform much better in this regards. While there were some cool styles in the clothing department, the overall feeling of the store (at least the one in Aventura) was that it was ‘dated’. This is particularly troublesome in light of the fact that Aventura Mall has some of the most upscale brands in the world, so by comparison, Sears looked even more dated then it probably is. The clerk in the electronics department didn’t speak English well. The other two clerks in the same department were seemingly disinterested in offering help. When we paid for our phone, the clerk didn’t even bother to say thank you, let alone happy holidays or something more cheery. The store layout was really tough. Hard to find the departments and items we were interested in. The directory by the store front was a list of which departments were on which floor, not where they were on the floor. Perhaps a design choice in getting people to stumble upon something else to buy? Overall, prices were not that good really, though there were some great sales prices (like our new house phone and even the karaoke machine). A recent steam mop I purchased from a comepetitor was offered for $20 more. Actually paying for the items was tough – we had to track down a sales associate to pay for the phone. When paying for Kristie’s socks, we looked around for a few minutes and eventually found a staffed customer service station (not a ‘check out’ stand btw). Unfortunately, we had to wait several minutes because a customer had started checking out, then went back to search for more clothing for his grand daughter, tying up the cashier for several minutes. After some audible groans from us, she did finally suspend that transaction, but by that point, we were finally at the front of the line for the other register. Sears.com is pretty good, though minor tweaks would make the shopping experience even better – for example, the shopping cart is missing some little things like “update all items in cart” (requiring me to remove each item one by one) which is more likely to make me abandon the purchase entirely (ran into this while trying to build the wish package for you. 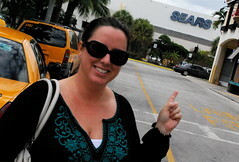 The sale prices were really pretty good and Sears stores are everywhere. I was really glad to see Sears is working with the Heroes at Home program to grant some wishes for military families – they are taking care of their own, with a very socially conscious program which makes my time invested here doing the review worth the while. I can’t say I will be running back into our local Sears store anytime soon, but I am happy to see Sears engaging. Unfortunately, the campaign really is a great lesson that a fresh coat of paint and a great pitch can’t change the brand by itself. It takes a complete retooling of the operations first and foremost, then to change the attitudes of the work force in order to change the product itself before you can make people feel different about your company. From the choice of flooring, to shelving, to hiring practices, to motivation, to inventory selection, everything is permanently inter-linked. One weak link may be overlooked, but several kills you and your opportunity to develop a meaningful relationship. Perhaps I am just not the target customer that Sears is reaching for. Are you? 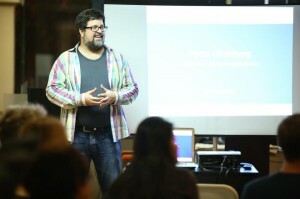 I wish to extend my thanks to Sears, and to IZEA, for inviting me to get involved in this program. As I have said for a long time to my clients (as a consultant), its not so much that people have negative things to say about your company insomuch as it is how you respond – what you say and do as a result. So in light of the relatively positive experiences posted around the K-Mart campaign, I am interested in seeing what happens as a result of this post. Is it a learning opportunity or is it time for corporate speak and a blind eye? I have selected a great package for you for feeding the mind, body and soul, or you can ignore my shopping choices (and the time I put into assembling the package) and pick your own item #’s from sears.com and include that in the comments below or your own blog post. Please do read the rules completely as I am not in charge of the contest, Izea is, but here is a general overview of how it will work. Blog Comment: A reader can leave a comment on this blog with the name of the wish package they would like to win. (I only made one, so its either the mind/body/soul wish or your own wish. A blogger can enter by writing a post about the contest and linking back to your post. Be sure to leave a comment with the URL to their post as trackbacks don’t always work. If readers don’t want to win the specific package I selected you can put together your own Wish package by leaving the package item#s from sears.com in the comments (up to $500) in value. So you may think this post was paid for by Sears, and indeed it was – but in my mind they didn’t pay for me to post this (would you pay for a review like this?) but they paid me for my time (and underpaid me at that as I sit here at 5am completing the post after spending several hours in the store, browsing the online store and reviewing program details for compliance). In short, it feels more like a mystery shopper program with complete transparency, coupled with a giveaway. Its not about getting paid to promote them so much as it is getting paid to invest my time interacting with their brand and then sharing my experiences with you. The original issues people had with the notion of getting paid to blog about a company had two main points: 1 transparency of transaction and intention – make it clear what you got paid and what you got paid for; 2 perceived lack of objectivity – in that people believe that honesty goes out the window when someone gives you something, which just isn’t the case for everyone, while it may be for some. I believe that this post adequately addresses those issues and believe you will find that to also be the case, though your opinion of such programs may not change as a result. Regardless, I learned a lot so far, and expect to learn a lot more this week as I hear your feedback. Best of luck – I hope you win and I hope you enjoy one of the packages I selected for you. Oh yeah, and just in case the title wasn’t clear enough, I received a $500 gift card to shop at the store, share my experience and give you a chance to win $500 wish too.